The ten-day weather forecast for Leeds (or at least the one available at the time of writing, these forecasts have a habit of changing) doesn’t make pleasant reading for an Australian side one Test down with two to play. 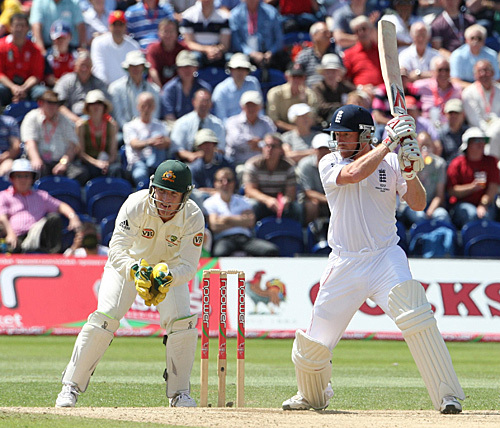 Given the impact that losing a day’s play (or more) tends to have on Test matches – and the growing feeling that Headingley’s reputation as a bowler’s pitch with a wicket that “is variable, and – particularly when there is cloud cover, too – aids seam bowling” may be based more on the past than the present – means that the draw is the favourite. 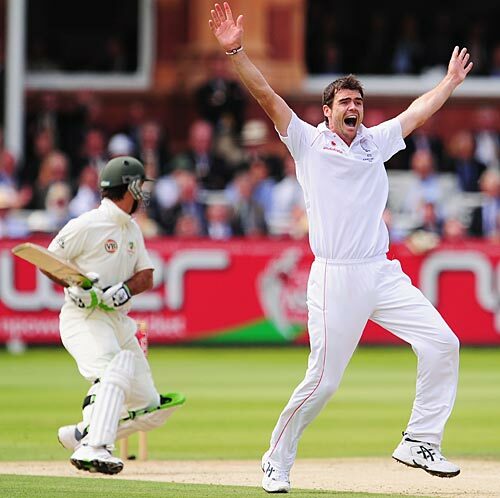 If things do turn out that way, then the last Test at the Oval could be a repeat of the dramatic match at the same venue in 2005, with England needing merely to hold out for a draw to regain the Ashes. If the weather doesn’t improve in South London, then not even shares in Altrincham will be enough to cheer up Ricky Ponting. The long-range outlook is for sunshine and showers, which in the UK is a bit like saying ‘same as usual, but maybe slightly warmer’. On most levels, it would be a shame to see the series decided by the weather, but I’ll wager that there are more than a few England fans out there perfecting their rain dances. UPDATE: The forecast is now looking a fair bit brighter, but things have been so changeable recently that it’s difficult to be sure. In all the excitement about England’s remarkable batting to save the First Test (Monty Panesar faced 35 balls, for goodness’ sake), and all the inevitable claims about the effect on the remainder of the series, it’s important to remember that the finish was only as dramatic as it was because England failed spectacularly both in taking Australian wickets and in defending their top-order wickets. It is to be hoped, as well, that the failure of the bowlers isn’t overshadowed by today’s events (not even by the Ryanair protest which may have saved England). Australia dominated the match from lunch on Day 2, took 14 more wickets than the hosts managed, and nearly won having conceded 435 runs. Overall, I think an Australian series victory is still pretty much nailed-on, but for now I’m clinging to Paul Collingwood‘s innings as a sign that there is at least some mental strength in the England side. That and the thought of Ricky Ponting being upset (which he probably isn’t – the Aussies will undoubtedly win at Lord’s anyway). It’s the Ashes. Everyone’s still talking about the 2005 series. England have made a ‘big’ score, mainly thanks to Pietersen and Collingwood but with contributions from others too, everyone in the UK has got even more excited about this, then Australia have got in and, with no small contribution from Ponting, have made the ‘big’ score look a lot less impressive. 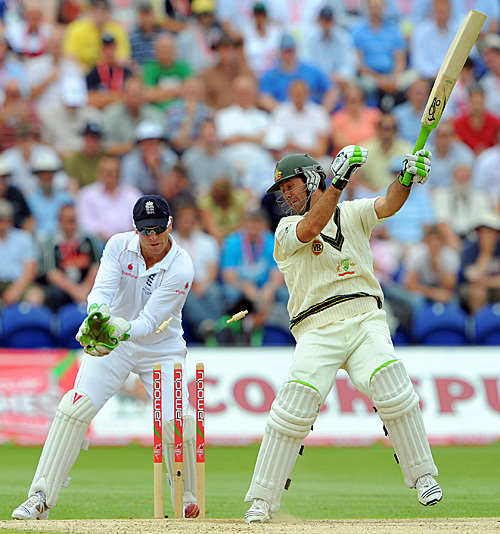 Am I talking about the current Test at Cardiff, or the Test at Adelaide in December 2006? Whilst England’s cause isn’t quite so parlous a state as it was after throwing away that Test two-and-a-half years ago, the ease with which Ponting and Katich have eaten into England’s lead is more than enough cause for Pommie concern.